Unlike air conditioners, fans only move air—they do not directly change its temperature. Therefore ceiling fans that have a mechanism for reversing the direction in which the blades rotate (most commonly an electrical switch on the side of the unit) can help in both heating and cooling. as they spin. The breeze created by a ceiling fan speeds the evaporation of perspiration on human skin, which makes the body's natural cooling mechanism much more efficient. Since the fan works directly on the body, rather than by changing the temperature of the air, during the summer it is a waste of electricity to leave a ceiling fan on when no one is in a room. IN WINTER, ceiling fans should be set to turn the opposite direction (usually clockwise; the blades should spin with the downward turned side leading) and on a low speed. Air naturally stratifies — that is, warmer air rises to the ceiling while cooler air sinks. Unfortunately, this means it is colder on or near the floor where human beings spend most of their time. A ceiling fan, with its direction of rotation set so that air is drawn upward, pulls up the colder air below, forcing the warmer air nearer the ceiling to move down to take its place, without blowing a stream of air directly at the occupants of the room. 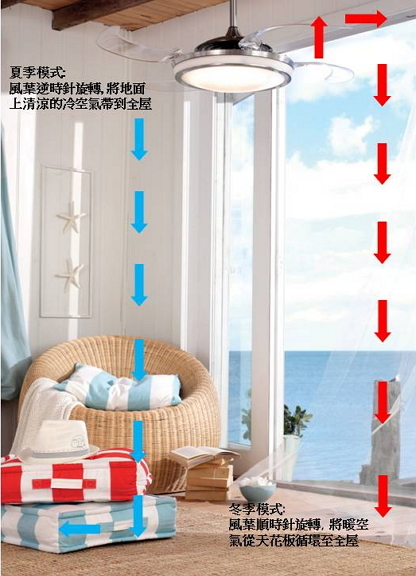 This action works to even out the temperature in the room, making it cooler nearer the ceiling, but warmer nearer the floor. Thus the thermostat in the area can be set a few degrees lower to save energy, while maintaining the same level of comfort. It is important to run the fan at a low speed to minimize the wind chill effect described above. An additional use of ceiling fans is coupling them with an air conditioning units. Air conditioning units have both the tasks of cooling the air inside the room and circulating it. Provided the ceiling fan is properly sized for the room in which it is operating, its efficiency of moving air far exceeds that of an air conditioning unit, therefore, for peak efficiency, the air conditioner should be set to a comfortable temperature and low fan setting and the ceiling fan should be used to circulate the air.